Welcome everyone. The purpose of this guide is to help players of all levels improve their game. After a lot of feedback from players and forum members I have revised it to incorporate different skill levels. 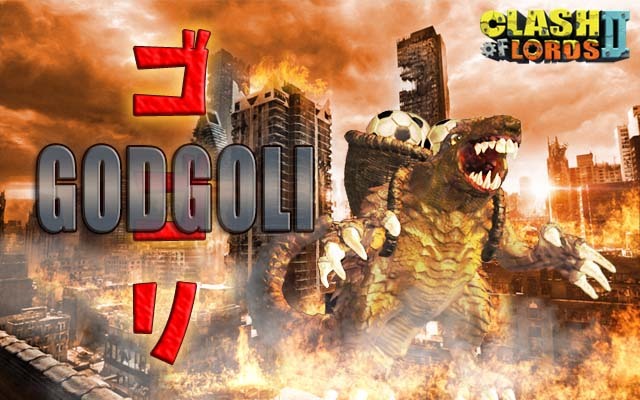 The guide is divided into two sections: Team Formations and Battle Royale Levels. As new content is released I will update the guide. Video Guide: The videos below are supplementary content for the Battle Royale Levels Section. The purpose of which is to provide a visual for where heroes can be dropped. If you are only going to use the videos without reading the content then the videos may not make much sense. There are three ways you can approach building a battle royale team: Mercenary builds, Hero builds, and Hybrid builds. The prominent theory is that Mercenary builds are currently the strongest. However, with the release of new heroes and the 3rd aid slot (4/16/2015) Mercenary builds will likely be outperformed by Hero and Hybrid builds. What is certain is that at lower ranks Mercenary builds are the best beginning choice. 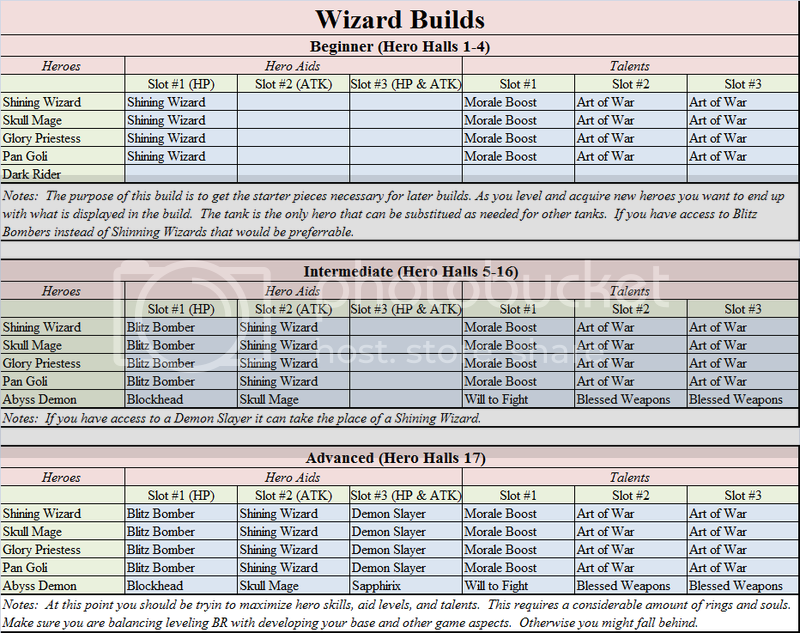 There is really only going to be one or two hero builds for BR because they are completely based on evolution skills. The farther you are in your evolution skills the easier ti will be to defeat the last 7 levels. This seems like common sense but there still is a priority for evolution skills. Renee Ven and Pounder are must. Renee Ven because at evolution level 3 she can refresh any other evolution skill. Pounder's evolution is important because it can clear high level walls to direct other heroes and mercenaries be providing a clear target instead of fanning out in all directions. Other useful heroes include: Sapphirix, Abyss Demon, Arctic Lord, Great Sage, and Landslide. However, these heroes are also the most costly to level and the hardest to get shards for. However, the advantage of building a hero formation for BR is that the heroes can also be used in Lords League, Arena, Resource Raid, Guild Clash, and on Defense. 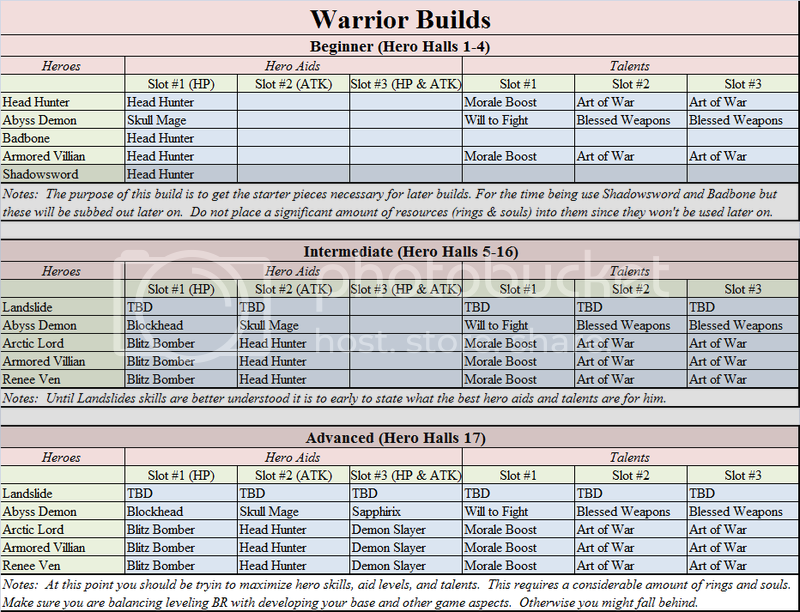 There are 17 levels for BR and your method of attack will vary with each one. They can be divided up into two sections; 1-10 and 11-17. The reason I have divided them up between the two is at level 11 it becomes increasingly difficult to use mercenary builds. 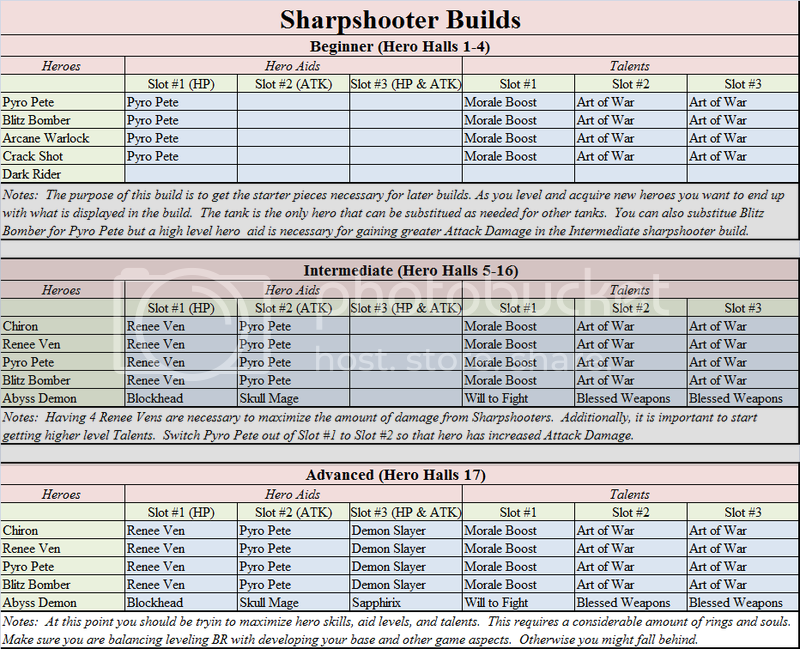 If you have a high level sharpshooter or wizard build you can solo the first 10 levels by yourself in one week using 2 extra chances a day. If you have a monthly package and are not in a guild this is an excellent way to farm mutagen for something you would be doing anways. Special thanks to Nightswatch and Revolution for allowing me time to complete the guides even though by doing so it hurt both guilds' BR standing. Both are great guilds are I highly recommend joining either one if you ever get the chance. 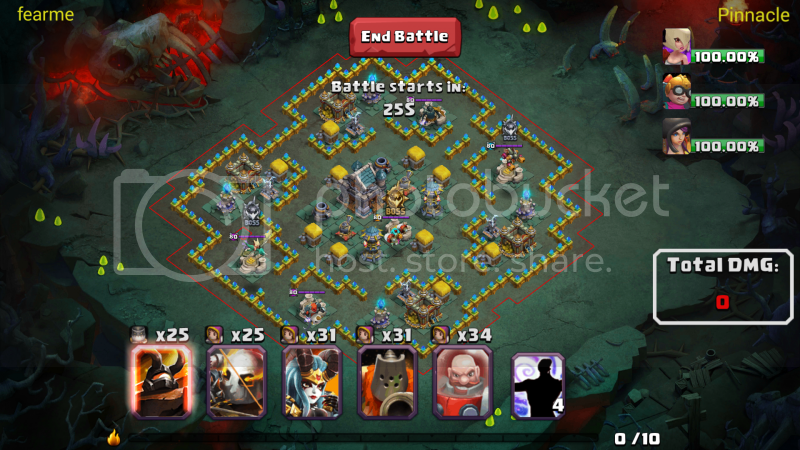 Strategy: Drop your whole army at once in any of the 4 corners of the base. There are little to no defenses so the faster you can get to the guild hall the sooner you can start doing damage. Save allied winds until all mercenaries are attacking the guild hall and your skills are either cast or ready to be cast. If you can do 12.6 million damage you can one shot this level by yourself. Strategy: The left side of your screen is the weaker side. If you drop by the enemy Hercules your army will rush towards the tower. There is no order yet for which ones you should attack first. It is just easier and quicker to get to the tower from the left side. Do the same thing as you did in the first level. Drop the entire army at one point and wait to cast allied winds until everyone is attacking the tower. If you can do 18 million damage you can one shot this level by yourself. Strategy: Attack after Tower Boss has been defeated. Strategy: Save the cannon for last because it is the hardest to get to by being in the center of the map. The left or top side of your screen is the weak side. If you drop in either corner your army will rush towards the towers. 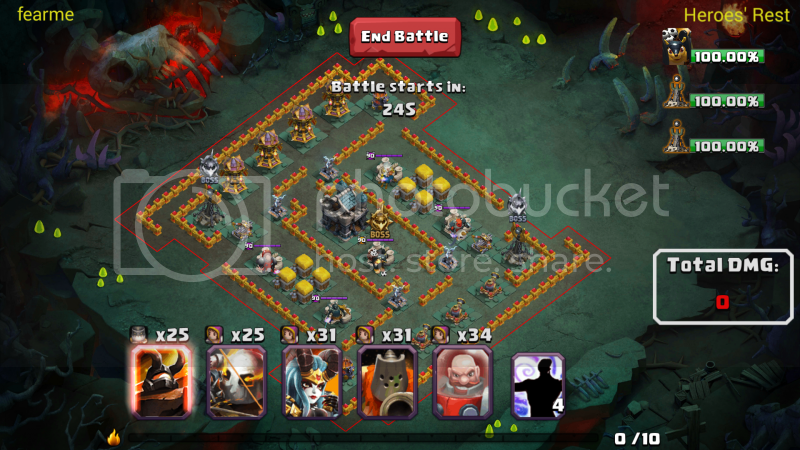 Both Towers should be eliminated before attacking the cannon boss. If you can do 31.2 million damage you can one shot this level by yourself. Strategy: The left side or top side of your screen is the weak side. If you drop in either corner your army will rush towards the Tower. 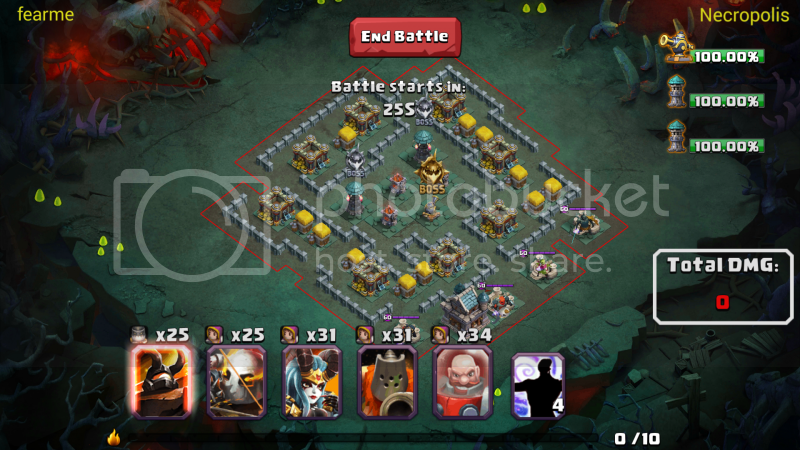 Both Towers should be eliminated before attacking the cannon boss. Strategy: Save the magic tower for last again. You will start to see this as a common theme that the main boss is in the middle of the map. Once both Dark Rider and Savage Chief have been defeated drop half of your army on one side and the rest on the other half. This way the magic tower will not doll out damage to all mercs. Additionally if you can time it right you would want Abyss Demon to be on the side that gets attacked first. That way he can heal the ones being damaged. If your healing ability is strong enough you can also drop your whole army on one side and heal threw any damage. If you can do about 64.5 million damage you can one shot this level by yourself. If you are soloing you can clear all 4 levels on the first day. After which it will be one per day until the end of the week. Strategy: There is not really any order to which of the two enemy heroes you should attack first. Neither have any type of aoe damage that can hurt a condensed army. If you are having trouble I would attack Savage chief first because his skill doesn't reduce damage dealt. Strategy: Save Air Elite for last. Once both Dragon Rider and Mechanoid have been defeated drop half of your army on one side and the rest on the other half. This way the Air Elite will not doll out damage to all mercs. Again, if you have strong enough healing and can weather the damage drop your whole army in one spot. Use only one tank in this map with high health. Ideally you would want Air Elite to target him and follow him around. Once all structures are destroyed the melee hero will stay still and only receive damage. The higher the health the longer it will take Air Elite to start doing damage to mercs and heroes. Strategy: Like the previous level there is no advantage to starting with either one because they are on opposite sides. However, there is a small opening near Dragon Rider that you can drop your tank into so Dragon Rider or Air elite will target him first. Otherwise, there is not really any order to which of the two enemy heroes you should attack first. Neither have any type of aoe damage that can hurt a condensed army. Strategy: Save Pan Goli for last. Once both Victory Statues have been defeated drop your army together. You don't have to drop half and half because Pan Goli does not have that type of aoe damage and it is faster just to go from one side. Use only one tank in this map with high health unless you are having trouble living through Victory Statues or Pan Goli. If so use two but you will see a drop in damage because of this change in strategy. If you are doing the sharpshooter build then chiron's clones will help absorb some of the damage dealt by Pan Goli. Strategy: Drop your tank as close to VS as you can. What should happen is that they will run around the wall to attack it. Drop in rest of your army now that the focus will stay on your tank. Once whole army is out pop skills and drop Allied Winds. Repeat this on the other VS on the opposite side. Strategy: Save Victory Statue for last. Once all secondary bosses have been defeated drop your army together. They will likely split up but at least half should target the Victory Statue while the remaining clear base and then come back to Victory Statue. If you are having difficulty again then bring two tanks. 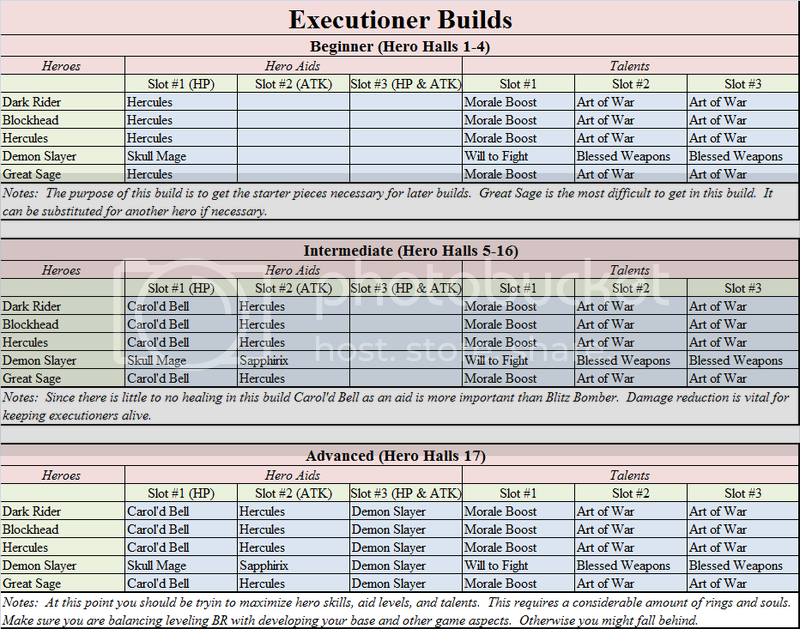 Executioner and Warrior builds will clear entire outside before going to Victory Statue. Strategy: I prefer to attack this one first because it is in-between the two other heroes. So later on when I am attacking blitz or Air elite I don't pull Skull Mage. Additionally he is the closest to attack. If you are using all ranged they should stay on Skull Mage the entire time with no risk of aggro on anything else. Strategy: Drop in tank and wait for blitz to aggro to him then drop in rest of army so that they target him. If you drop everyone in at once there is a chance your army will split and blitz will take out your heroes and mercs. Strategy: Drop in tank and wait for blitz to aggro to him then drop in rest of army so that they target him. If you drop everyone in at once there is a chance your army will split and Air Elite will take out your heroes and mercs. Strategy: Save Pan Goli for last. Once all mortar bosses been defeated drop your tank in the small opening right below the guild hall. This will pull Pounder and then drop in rest of your army. Pounder is going to clear away some of your army with his aoe skill. You can divide your army up but will likely suffer less damage. This will depend on the level of your army and how well they perform. 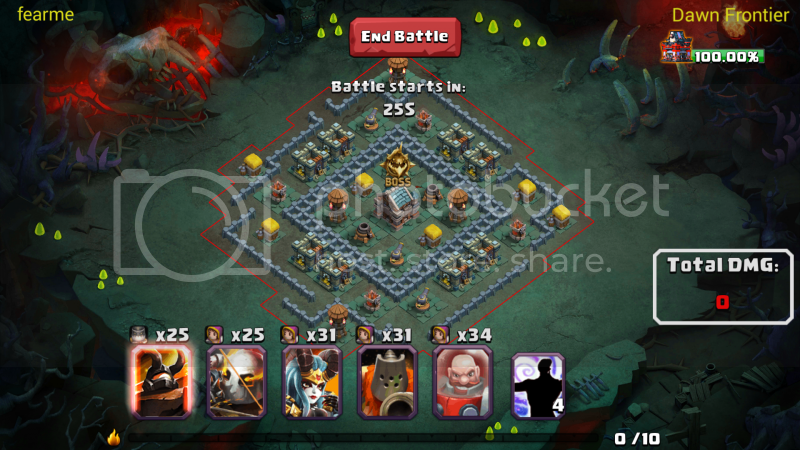 Strategy: So it does matter now which mortar you attack first. The middle or top side mortar is the worst to go after because the left and right will clean house on your mercs. Even with an Abyss Demon the stun will eventually prevent him from healing all of them. Once you kill off the right or left then work your way around. Strategy: No matter which outside mortar you attack first this should be your second target. Strategy: This mortar will be the easiest to kill because you will not aggro Pounder and won't be taking damage from the Top Side Mortar. Strategy: Demon Slayer will be last (told you there was a trend). If all other heroes are dead then drop in your army against the wall by the air defense north of the guild hall. This seems to be the best place to aggro the Demon Slayer boss. Strategy: This should be the first boss to die. There is a small indentation just to the right of Savage Chief. Drop your tank as close to it as you can. While they are trying to break through the wall this should draw Savage Chief to you. At which point drop in your army right in the same spot. They should all end up targeting him. Strategy: Pounder should be the second boss to die. There is a small indentation just to the upper-right of Pounder. Drop your tank as close to it as you can. While they are trying to break through the wall this should draw Pounder to you. At which point drop in your army right in the same spot. They should all end up targeting him. Try to burst him as quickly as possible using two Allied Winds at once. The longer he is alive the more likely he will aoe your mercs. Strategy: Blockhead is the third target. There is a medium sized indentation to the top of blockhead. Drop your tank as close to it as you can. While they are trying to break through the wall this should draw Blockhead to you. At which point drop in your army right in the same spot. They should all end up targeting him. If you have a high enough build this can be your first drop. You will aggro both Blockhead and Pounder so you will need a tank that can survive both. However, you will be able to clear both and proceed to do some damage to Savage Chief and Demon Slayer before time runs out. Strategy: This is the fourth boss you should go after but he will follow your tank so drop in everyone as close as you can to him. Don't drop them in the opening in the wall. We want your tank to stand still and have to break through each wall. This way your army is not running around and instead attacking Air Elite. Be careful with Allied winds and drop them slightly ahead so your army still stays in it or walks into it. Be prepared to also pull Demon Slayer while fighting Air Elite. You may have to save an Allied Winds for Abyss Demon to regenerate his health if it is getting to low. 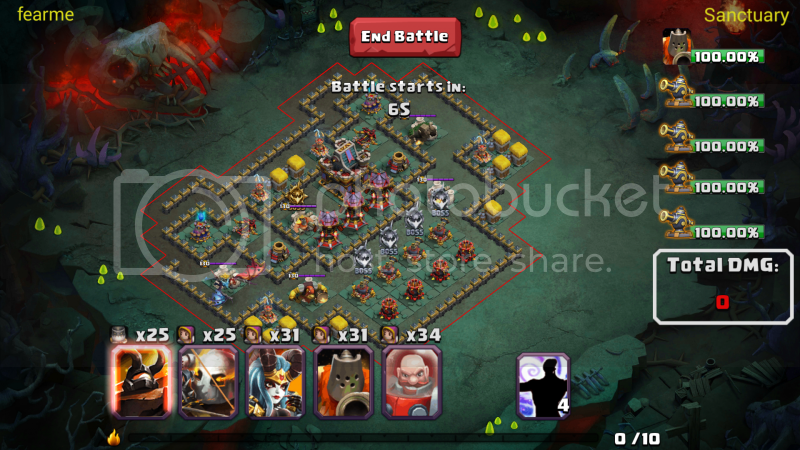 Strategy: After the all 4 Cannons are killed off then attack Blitz Bomber. Drop your army in the small indentation on the left side of the screen. You will pull Hydra and Pounder but shouldn't Pull Pan Goli unless your mercenaries do by accident. Strategy: This should be the first boss to die. Drop in your army to kill off Pan Goli hero. At which point they should all turn to the first cannon. Drop two Allied Winds because there is going to be a lot of sustained damaged on you. You are trying to burst them down. Next time Chiron and Pyro Pete's skills before dropping the next two Allied Winds. 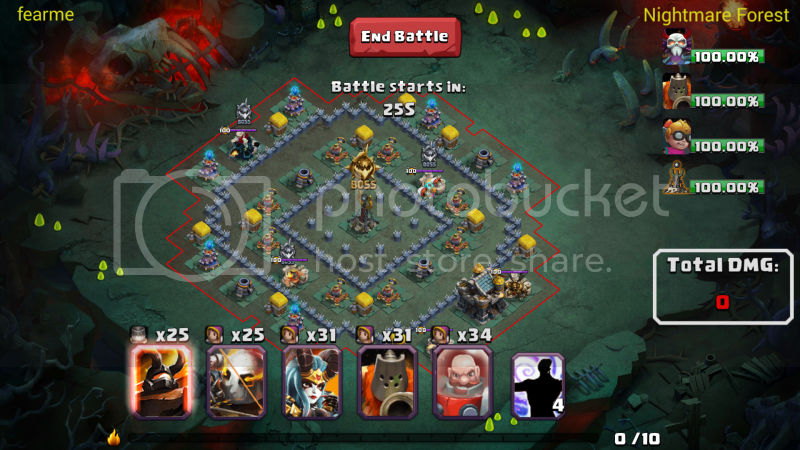 Strategy: This is the second boss to target and you should follow the exact same strategy used on the Right Cannon. If you are high enough level after you kill off the first cannon you will proceed to this one automatically since it is so close. Strategy: This is the next closest cannon that will not pull aggro on Blitz Bomber. Follow the same strategy used for the Right Cannon. Strategy: This cannon is last boss to die before Blitz Bomber. However, it will also be the easiest to kill off because no other cannon bosses will be left. see this is a freaking guide man can we have this as the example and delete the information people post that we can get in the game that they just copy and pasted? Great guide. I really like the attention to detail and strategy that you have provided. 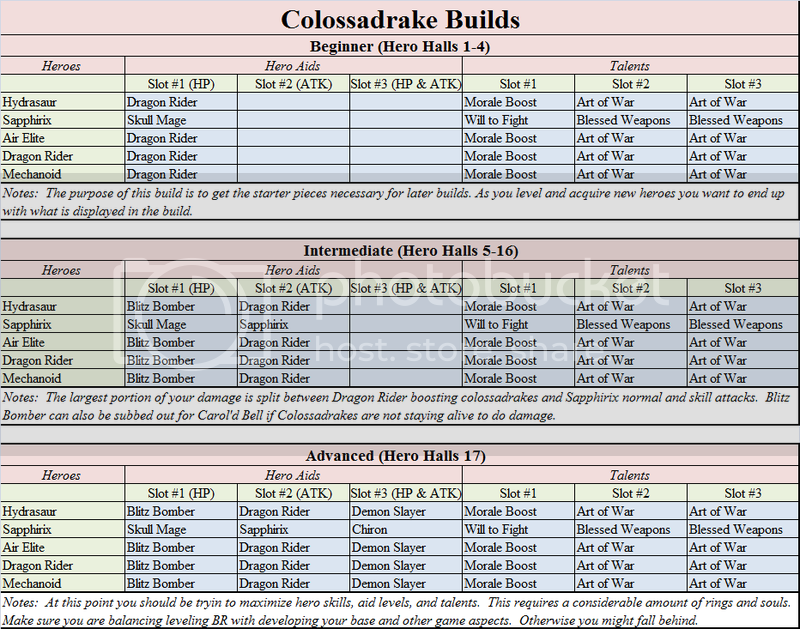 I also like the guides you put at the top for the different builds. There is room for improvement. Switch out your Morale Boost talent with Art of War 3/3 and you will get even more damage. When you think about it, you are already getting 160% and 50% from RV and PP, adding another 16% from morale boost, is actually a net 7.6% increase because you are already have 210% bonus, whereas adding 3 more archers is a 9.7% increase. This of course depends on your levels of your aid skills, the higher they are, the less beneficial Morale Boost is and more beneficial Art of War is. This also makes the assumption that your aid skills are at max level. The difference is 2% or so, but when you are talking about 56M damage, 2% can be significant over 3 minutes. 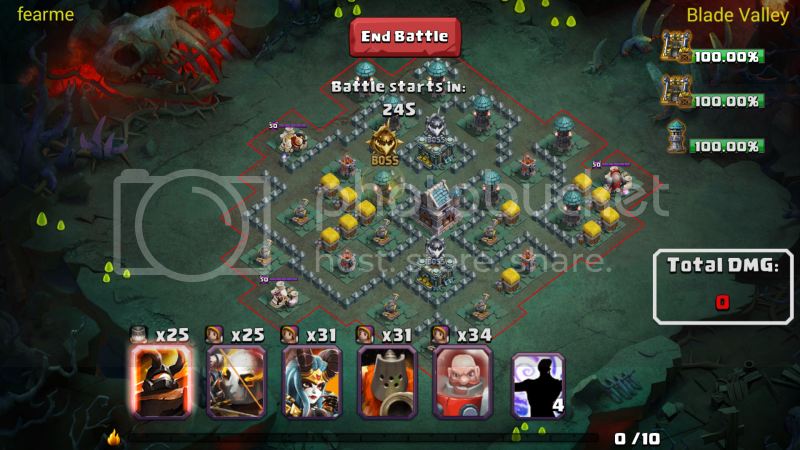 What level are your archers, and what is their base attack? I choose to keep a morale boost in there because I find that some sharpshooters always wander off when dropped. When my build is complete I will have 154 sharpshooters Not all of them end up attacking the boss. That is why I choose to have morale boost because having three extra mercenaries does me no good if they are not attacking the right target. Right now my Renee's are all max aid, my Pyro's are on level short of max aid, and my Demon Slayers are 5 levels short of max aid. As for my sharpshooters attack level. They are all 45 or 50 at the moment. I noticed you also put will to fight, and blessed weapons as talents on your Abyss Demon. What is the difference between these two and why two of one, and one of the other? Also, why do you suggest using Pyro Pete as an aid instead of Blitz Bomber? Both will get up to 50% DMG for mercs, but BB can get up to lvl 180, while PP only 160. Plus BB can be used for any merc type, while PP can only be used for Archers. It is easier to acquire PP when you are first starting out. They make more of an impact early on. awesome! should record videos too. Easy to show us whats going on. For abyss I prefer 3x attack speed passives, over attack. Better to hit faster for 7700, than hit slower for 8800. Macross I deleted the 3 duplicate posts above. It looked like you got very excited. Made me giggle. Second I have videos for the first 10 levels. The first two are posted in links. The next 8 have to be edited. Unfortunately, I have so many sharpshooters the 1:30 BR attempt takes 3 minutes of record time because my phone can't process everything at once. Otherwise if no one cares I will publish them raw and edit them all at later times. lol nah, was a bug with the forum haha, it looked like it wasn't posting lol. So I hit the send button a few too much^^ Just publish raw works. I am going to save this post for the links to all the videos at a latter date and will post them all in here. I don't like making duplicate threads on the same topic so it seems best way to keep it all in one spot.